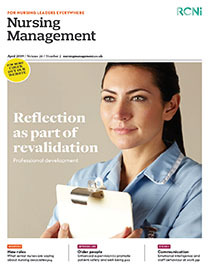 This article describes how ‘capstone’ assessments were created to provide two different student groups, nursing and performing arts students, with a lived experience of learning together about their own fields of practice. Capstone assessments combine ‘live’ human simulation with self‑reflection and peer review. A capstone assessment is the integration of a body of relatively fragmented knowledge and learning to form a unified whole and can be used as a transitional assessment and a bridging experience to connect knowledge between modules or courses. The capstone assessments involved two faculties and four modules, three nursing and one performing arts. Case studies were designed to represent real-life situations that students were likely to encounter during their careers, either playing a patient as an actor or performing a caring role as a nurse. Assessments for the capstone simulation were formative, and involved the students engaging in self-reflection and peer review. Videos were available to enhance the self-reflection and peer-review process. Evaluation was undertaken through verbal feedback during debrief, written feedback, video footage and nursing student and acting student peer review. The experience of capstone assessments for two diverse student groups provided valuable learning from their own and from a different group outside their subject area.